Face-to-face conversation between two or more people is a universal form, and perhaps the basic form, of social interaction. It is the primary site of social interaction in all cultures and the place where social and cultural meaning takes shape. Face-to-face conversation between children and parents can also be an important context for social and cognitive development. Given the universality, frequency and importance of conversation in social life, a psychological model of conversation is required for an understanding of the central issues in social and developmental psychology. This book provides such a model. 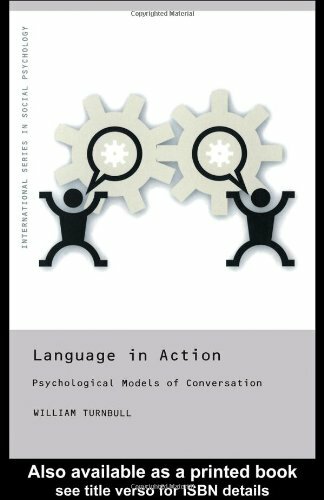 Language in Action presents a critical examination of four models of conversation: the Code model based on Chomsky's linguistic views; the Speech Act model of Austin and Searle; the Inferential model of Grice, and the Conversation Analytic model of Sacks and Schegloff. It also considers the Brown and Levinson model of politeness in conversation. Using many examples from natural talk and drawing on the positive aspects of the reviewed models, Turnbull proposes a new Social Pragmatic model of conversation as social interaction. He also describes the research paradigm of Social Pragmatics that experimental psychologists can use to study conversation. This book will be invaluable for advanced students in psychology, sociology, language and linguistics and communication. It will also make fascinating and lively reading for anyone wanting a greater understanding of this fundamental form of social interaction.